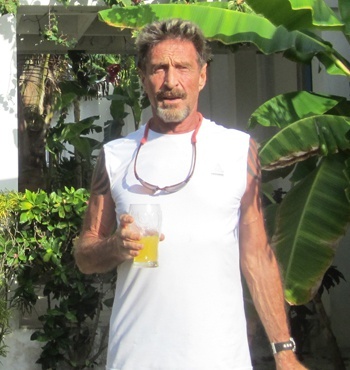 John McAfee is on the run from Belize police following the shooting of a fellow American last weekend. John McAfee, one of the early pioneers of the antivirus software industry, is wanted for murder by the Belize national police force. He is currently a prime suspect in the shooting of American expatriate Gregory Faull, who was killed in his home sometime in San Pedro Town on Saturday night. Reports say that the two men had been on unfriendly terms for some time, with Faull even going so far as to file a formal complaint against McAfee for firing guns and displaying "roguish behavior". McAfee Associates, now known as McAfee, Inc., helped popularize the concept of web security as early as 1987, when the world was still coming to grips with the internet. After selling the organization for $100 million, John McAfee moved to Belize to start a herbal drug operation, which is when things got a little odd. Reports indicate that as McAfee's herbal company stalled, he became increasingly erratic. He found himself estranged from other American expatriates in the country, and stated that he'd hired criminals and drug traffickers for his security staff. More recently, McAfee reportedly began posting on the Russian-hosted website Bluelight about his efforts to purify bath salts, a drug known for its hallucinogenic effects. In April, police arrested McAfee and led a raid on his compound that uncovered a chemistry lab and an entire armory of weapons. After discovering that everything was licensed and legally obtained, McAfee was reluctantly released. Faull was found by his housekeeper on Sunday morning with a gunshot wound to the head and his laptop and iPhone missing. Police are following several leads, but given McAfee's behavior and relationship with Faull, he is currently considered a prime suspect in the investigation. McAfee and Faull's most recent argument appears to have revolved around dogs, most likely guard dogs kept on McAfee's property. A representative from McAfee, Inc. has stated that it will not comment on former employees, save to say that the company is no longer associated with its founder. UPDATE: According to Wired, McAfee is hiding from the authorities while proclaiming his innocence. The article explains that when McAfee saw the police approaching his property, he quickly buried himself in sand, placing a cardboard box over his head so he could breathe. "It was extraordinarily uncomfortable," he said, "But they will kill me if they find me." McAfee claims that he knows nothing about the shooting, and that his position as prime suspect is due to a government vendetta against him. McAfee also claims that the authorities poisoned his guard dogs. "The coast guard dropped off a contingent of black-suited thugs at 10:30 tonight at the dock next door," McAfee said, "They dispersed on the beach. A half hour later all of my dogs had been poisoned. Mellow, Lucky, Dipsy, and Guerrero have already died." Belize's Gang Suppression Unit denies any attempt to poison McAfee's guard dogs. "This guy amazes me every day," unit head Marco Vidal said. "We don't have anything personal against Mr. McAfee. There is no need for us to poison dogs."